Citation: M.Gomathi, D.Seenivasan. 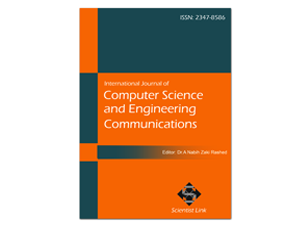 "Enhanced Dynamic Multi-Keyword Rank Scheme using top Key over Encrypted Cloud Data" International Journal of Computer Science and Engineering Communications,Vol.4,Issue.2.(2016):1337-1342. The cloud computing platform gives people the ability to share resources, services and information among people from all over the world. In the increasing popularity of cloud computing, more and more data owners are motivated to outsource their data into cloud servers for great convenience and reduced costs in data management. The sensitive data should before the outsourcing of data protection requirements, data usage obsoletes such as keyword-based document retrieval is encrypted. Improved dynamic multi-keyword ranking search scheme with top key via encrypted cloud data that simultaneously supports dynamic update operations as deleting and inserting documents. Greedy depth first search algorithm is provided for efficiency multi keywords on place and index structure. The safe kNN algorithm is used to encrypt the index and query vectors and ensure precise meaning score calculation between encrypted index and query vectors. A secure multi-keyword search is controlled via encrypted cloud data that simultaneously supports dynamic update operations, such as deleting and inserting documents. Here, focus on the data security problems with extended searchable symmetric encryption. For the first time formulate the issue of privacy in terms of relevance and similarity scheme robustness. The observation of these server-side rankings inevitably leak based order-preserving encryption protection. In order to eliminate the leak, we propose to support the top-k Multi-full-text search. Thorough security and performance analysis show that the proposed scheme guarantees a high safety and practicality and dynamic update operations, such as deleting and inserting documents. Keywords:Advanced Symmetric Encryption Certified Authority,Cloud data, Data security, Keyword Based Retrieval, Multi keyword Retrieval. Mark D. Ryan,” Cloud computing security: the scientific challenge, and a survey of solutions” University of Birmingham January 28, 2013. Cong Wang, Ning Cao, Jin Li, Kui Ren, and Wenjing Lou,” Secure Ranked Keyword Search over Encrypted Cloud Data” International Conference on Distributed Computing Systems, 2010. Ming Li, Shushing Yu, Ming Caoand Wenjing Lou” Authorized Private Keyword Search over Encrypted Data in Cloud Computing”, 31st International Conference on Distributed Computing Systems, 2011. Jiadi Yu, Peng Lu, Yanmin Zhu, “Toward Secure Multikeyword Top-kRetrieval over Encrypted Cloud Data,” IEEE member, IEEE Transactions on dependable and secure computing, vol. 10, no. 4, July/august 2013. Ming Cao, Cong Wang ,”Privacy-Preserving Multi-Keyword Ranked Search over Encrypted Cloud Data”, IEEE Transactions on parallel and distributed systems, vol. 25, no. 1, January 2014. Yi Yang, Hongwei Li, Wenchao Liu, Haomiao Yao, Mi Wen,” Secure Dynamic Searchable Symmetric Encryption with Constant Document Update Cost”, School of Computer Science and Engineering, University of Electronic Science and Technology of China, Globecom - Communication and Information System Security Symposium, 2014. Chi Chen, Xiaojie Zhu, “An Efficient Privacy-Preserving Ranked Keyword Search Method”, Member, IEEE, IEEE DOI 10.1109/TPDS.2425407, IEEE Transactions on Parallel and Distributed Systems, 2015. Wenhai Sun, Bing Wang, Ming Cao,”Privacy-preserving Multi-keyword Text Search in the Cloud Supporting Similarity-based Ranking “asia ccs’13, May 8–10, Hangzhou, China. Copyright 2013 acm 978-1-4503-1767-2/13/05, 2013. Chinua Xia, Xinhui Wang,” A Secure and Dynamic Multi-keyword Ranked Search Scheme over Encrypted Cloud Data”, DOI 10.1109/TPDS. 2401003, IEEE Transactions on Parallel and Distributed Systems, 2015.